[E.g. 6,2,3] This is important so that we can ensure booster and baby seats are issued where required. 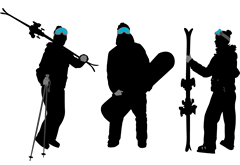 Please let us know how many ski and board bags you will have. By clicking the box you accept, as the 'party leader', you have read and understood both web page links listed (Terms&Conditions AND Inclusive Transfer Times).